A Widget() is responsible for a section of the page materialized by the DOM root of the widget. Should be set to the name of a QWeb template. If set, the template will be rendered after the widget has been initialized but before it has been started. The root element generated by the template will be set as the DOM root of the widget. Used to generate an id attribute on the generated DOM root. Used to generate a class attribute on the generated DOM root. Mapping (object literal) of attribute names to attribute values. Each of these k:v pairs will be set as a DOM attribute on the generated DOM root. None of these is used in case a template is specified on the widget. Renders the widget's DOM root and sets it. The default implementation will render a set template or generate an element as described above, and will call setElement() on the result. Any override to renderElement() which does not call its _super must call setElement() with whatever it generated or the widget's behavior is undefined. The default renderElement() can be called repeatedly, it will replace the previous DOM root (using replaceWith). However, this requires that the widget correctly sets and unsets its events (and children widgets). Generally, renderElement() should not be called repeatedly unless the widget advertizes this feature. parent (Widget()) -- the new widget's parent, used to handle automatic destruction and event propagation. Can be null for the widget to have no parent. asynchronous startup of the widget once it's been injected in the DOM, generally used to perform asynchronous RPC calls to fetch whatever remote data is necessary for the widget to do its work. Must return a deferred to indicate when its work is done. destroys the widget's children, unbinds its events and removes its root from the DOM. Automatically called when the widget's parent is destroyed, must be called explicitly if the widget has no parents or if it is removed but its parent remains. A widget being destroyed is automatically unlinked from its parent. A significant issue with RPC and destruction is that an RPC call may take a long time to execute and return while a widget is being destroyed or after it has been destroyed, trying to execute its operations on a widget in a broken/invalid state. This is a frequent source of errors or strange behaviors. reject -- by default, if the RPC call returns after the widget has been destroyed the returned deferred is left in limbo (neither resolved nor rejected). If reject is set to true, the deferred will be rejected instead. Re-sets the widget's DOM root to the provided element, also handles re-setting the various aliases of the DOM root as well as unsetting and re-setting delegated events. A widget will generally need to respond to user action within its section of the page. This entails binding events to DOM elements. The selector is used for jQuery's event delegation, the callback will only be triggered for descendants of the DOM root matching the selector1. If the selector is left out (only an event name is specified), the event will be set directly on the widget's DOM root. This method is in charge of binding events to the DOM. It is automatically called after setting the widget's DOM root. It can be overridden to set up more complex events than the events map allows, but the parent should always be called (or events won't be handled correctly). This method is in charge of unbinding events from the DOM root when the widget is destroyed or the DOM root is reset, in order to avoid leaving "phantom" events. It should be overridden to un-set any event set in an override of delegateEvents(). this behavior should be compatible with Backbone's delegateEvents, apart from not accepting any argument. After these two lines have executed (and any promise returned by appendTo() has been resolved if needed), the widget is ready to be used. the insertion methods will start the widget themselves, and will return the result of start(). If for some reason you do not want to call these methods, you will have to first call render() on the widget, then insert it into your DOM and start it. will unbind all DOM events, remove the widget's content from the DOM and destroy all widget data. Identifiers (id attribute) should be avoided. In generic applications and modules, id limits the re-usability of components and tends to make code more brittle. Most of the time, they can be replaced with nothing, classes or keeping a reference to a DOM node or jQuery element. Avoid predictable/common CSS class names. Class names such as "content" or "navigation" might match the desired meaning/semantics, but it is likely an other developer will have the same need, creating a naming conflict and unintended behavior. Generic class names should be prefixed with e.g. the name of the component they belong to (creating "informal" namespaces, much as in C or Objective-C). Global selectors should be avoided. Because a component may be used several times in a single page (an example in Odoo is dashboards), queries should be restricted to a given component's scope. Unfiltered selections such as $(selector) or document.querySelectorAll(selector) will generally lead to unintended or incorrect behavior. Odoo Web's Widget() has an attribute providing its DOM root ($el), and a shortcut to select nodes directly ($()). html templating/rendering should use QWeb unless absolutely trivial. All interactive components (components displaying information to the screen or intercepting DOM events) must inherit from Widget() and correctly implement and use its API and life cycle. To display and interact with data, calls to the Odoo server are necessary. This is performed using RPC <Remote Procedure Call>. Odoo Web provides two primary APIs to handle this: a low-level JSON-RPC based API communicating with the Python section of Odoo Web (and of your module, if you have a Python part) and a high-level API above that allowing your code to talk directly to high-level Odoo models. All networking APIs are asynchronous. As a result, all of them will return Deferred objects (whether they resolve those with values or not). Understanding how those work before before moving on is probably necessary. Access to Odoo object methods (made available through XML-RPC from the server) is done via Model(). It maps onto the Odoo server objects via two primary methods, call() (exported in web.Model) and query() (exported in web.DataModel, only available in the backend client). The interface is asynchronous, so instead of returning results directly RPC method calls will return Deferred instances, which will themselves resolve to the result of the matching RPC call. The query is only actually performed when calling one of the query serialization methods, all() and first(). These methods will perform a new RPC call every time they are called. For that reason, it's actually possible to keep "intermediate" queries around and use them differently/add new specifications on them. Calls the method method of the current model, with the provided positional and keyword arguments. The first set of methods is the "fetching" methods. They perform RPC queries using the internal data of the object they're called on. Fetches the result of the current Query() object's search. Fetches the first result of the current Query(), or null if the current Query() does have any result. Fetches the number of records the current Query() would retrieve. grouping (Array<String>) -- Lists the levels of grouping asked of the server. Grouping can actually be an array or varargs. The second set of methods is the "mutator" methods, they create a new Query() object with the relevant (internal) attribute either augmented or replaced. Adds the provided domain to the query, this domain is AND-ed to the existing query domain. Sets the provided offset on the query. The new offset replaces the old one. Sets the provided limit on the query. The new limit replaces the old one. Takes 1..n field names, in order of most to least importance (the first field is the first sorting key). Fields are provided as strings. Divergences from Django's sorting include a lack of random sort (? field) and the inability to "drill down" into relations for sorting. Odoo has powerful grouping capacities, but they are kind-of strange in that they're recursive, and level n+1 relies on data provided directly by the grouping at level n. As a result, while odoo.models.Model.read_group() works it's not a very intuitive API. This method is asynchronous when provided with 1..n fields (to group on) as argument, but it can also be called without any field (empty fields collection or nothing at all). In this case, instead of returning a Deferred object it will return null. equivalent to Model.query() but pre-filtered to only include the records within this group. Returns a Query() which can be further manipulated as usual. While the previous section is great for calling core OpenERP code (models code), it does not work if you want to call the Python side of Odoo Web. For this, a lower-level API exists on on Session() objects (the class is exported in web.Session, but an instance isusually available through web.session): the rpc method. This method simply takes an absolute path (the absolute URL of the JSON route to call) and a mapping of attributes to values (passed as keyword arguments to the Python method). This function fetches the return value of the Python methods, converted to JSON. A new module system (inspired from requirejs) has now been deployed. It has many advantages over the Odoo version 8 system. loading order: dependencies are guaranteed to be loaded first, even if files are not loaded in the correct order in the bundle files. easier to split a file into smaller logical units. no global variables: easier to reason. it is possible to examine every dependencies and dependants. This makes refactoring much simpler, and less risky. circular dependencies are not supported. It makes sense, but it means that one needs to be careful. The name is the concatenation of the name of the addon it is defined in and a name describing its purpose. The idea is that you define what you need to import (by using the require function) and declare what you export (by returning something). The web client will then make sure that your code is loaded properly. Modules are contained in a file, but a file can define several modules (however, it is better to keep them in separate files). Each module can return a deferred. In that case, the module is marked as loaded only when the deferred is resolved, and its value is equal to the resolved value. The module can be rejected (unloaded). This will be logged in the console as info. Rejected modules: The module returns a rejected deferred. It (and its dependent modules) is not loaded. web.core is a generic modules. It exports various useful objects and functions, such as qweb, _t or the main bus. The two other files are tour.js for the tours and compatibility.js. The latter file is a compatibility layer bridging the old system to the new module system. This is where every module names are exported to the global variable odoo. In theory, our addons should work without ever using the variable odoo, and the compatibility module can be disabled safely. declare all your dependencies at the top of the module. Also, they should be sorted alphabetically by module name. This makes it easier to understand your module. declare all exports at the end. always name your module properly: addon_name.description. use capital letters for classes (for example, ActionManager is defined in the module web.ActionManager), and lowercase for everything else (for example, ajax is defined in web.ajax). All testing helpers and structures live in the odoo.testing module. Odoo tests live in a section(), which is itself part of a module. The first argument to a section is the name of the section, the second one is the section body. test, provided by the section() to the callback, is used to register a given test case which will be run whenever the test runner actually does its job. Odoo Web test case use standard QUnit assertions within them. deep comparison between actual and expected: recurse into containers (objects and arrays) to ensure that they have the same keys/number of elements, and the values match. checks that, when called, the block throws an error. Optionally validates that error against expected. expected (Error | RegExp) -- if a regexp, checks that the thrown error's message matches the regular expression. If an error type, checks that the thrown error is of that type. checks that actual and expected are loosely equal, using the == operator and its coercion rules. As in the wider client, arbitrarily accessing document content is strongly discouraged during tests. But DOM access is still needed to e.g. fully initialize widgets before testing them. The top-level element of the scratchpad is not cleaned up, test cases can add text or DOM children but shoud not alter $scratchpad itself. To avoid the corresponding processing costs, by default templates are not loaded into QWeb. If you need to render e.g. widgets making use of QWeb templates, you can request their loading through the templates option to the test case function. The test case examples so far are all synchronous, they execute from the first to the last line and once the last line has executed the test is done. But the web client is full of asynchronous code, and thus test cases need to be async-aware. This example also uses the options parameter to specify the number of assertions the case should expect, if less or more assertions are specified the case will count as failed. Asynchronous test cases must specify the number of assertions they will run. This allows more easily catching situations where e.g. the test architecture was not warned about asynchronous operations. Asynchronous test cases also have a 2 seconds timeout: if the test does not finish within 2 seconds, it will be considered failed. This pretty much always means the test will not resolve. This timeout only applies to the test itself, not to the setup and teardown processes. If the returned deferred is rejected, the test will be failed unless fail_on_rejection is set to false. An important subset of asynchronous test cases is test cases which need to perform (and chain, to an extent) RPC calls. Because they are a subset of asynchronous cases, RPC cases must also provide a valid assertions count. If it matches the pattern model:method (if it contains a colon, essentially) the call will set up the mocking of an RPC call straight to the Odoo server (through XMLRPC) as performed via e.g. odoo.web.Model.call(). Otherwise, if it matches an absolute path (e.g. /a/b/c) it will mock a JSON-RPC call to a web client controller, such as /web/webclient/translations. In that case, the handler takes a single params argument holding all of the parameters provided over JSON-RPC. Mock handlers can contain assertions, these assertions should be part of the assertions count (and if multiple calls are made to a handler containing assertions, it multiplies the effective number of assertions). A test section, serves as shared namespace for related tests (for constants or values to only set up once). The body function should contain the tests themselves. Note that the order in which tests are run is essentially undefined, do not rely on it. Registers a test case callback in the test runner, the callback will only be run once the runner is started (or maybe not at all, if the test is filtered out). An integer, the number of assertions which should run during a normal execution of the test. Mandatory for asynchronous tests. Test case setup, run right before each test case. A section's setup() is run before the case's own, if both are specified. Test case teardown, a case's teardown() is run before the corresponding section if both are present. RPC method to use during tests, one of "mock" or "rpc". Any other value will disable RPC for the test (if they were enabled by the suite for instance). Whether the current module (and its dependencies)'s templates should be loaded into QWeb before starting the test. A boolean, false by default. The web client includes the means to run these tests on the command-line (or in a CI system), but while actually running it is pretty simple the setup of the pre-requisite parts has some complexities. Install PhantomJS. It is a headless browser which allows automating running and testing web pages. QUnitSuite uses it to actually run the qunit test suite. The PhantomJS website provides pre-built binaries for some platforms, and your OS's package management probably provides it as well. If you're building PhantomJS from source, I recommend preparing for some knitting time as it's not exactly fast (it needs to compile both Qt and Webkit, both being pretty big projects). Because PhantomJS is webkit-based, it will not be able to test if Firefox, Opera or Internet Explorer can correctly run the test suite (and it is only an approximation for Safari and Chrome). It is therefore recommended to also run the test suites in actual browsers once in a while. The version of PhantomJS this was build through is 1.7, previous versions should work but are not actually supported (and tend to just segfault when something goes wrong in PhantomJS itself so they're a pain to debug). For some tests, a source database needs to be duplicated. This operation requires that there be no connection to the database being duplicated, but Odoo doesn't currently break existing/outstanding connections, so restarting the server is the simplest way to ensure everything is in the right state. 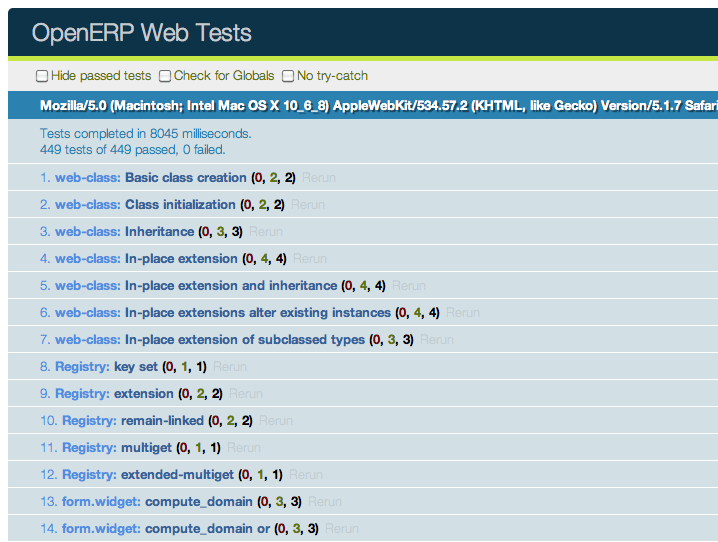 If you leave out -mweb, the runner will attempt to run all the tests in all the modules, which may or may not work. Congratulation, you have just performed a successful "offline" run of the OpenERP Web test suite. Note that this runs all the Python tests for the web module, but all the web tests for all of Odoo. This can be surprising. with a small twist: sqlalchemy.orm.query.Query.group_by() is not terminal, it returns a query which can still be altered.